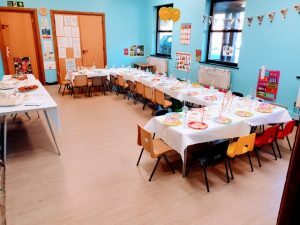 Use of the main hall, Pre-school room and kitchen. We have 8 gopak children’s tables measuring 3ft 1″ in length, 2ft 1″ in width and 1ft 11″ high. We have 40 children’s chairs in total. We have 17 adult’s tables measuring 6ft1″ in length, 2ft 4″ in width and 2ft 5″ high. Blackwell Hall is ideal for children’s parties, a favourite for many families who return year after year, praised by entertainers who frequently entertain parties at our venue. With a maximum capacity of 150 people, you are not restricted if your child wishes to invite everyone in his or her class! The day and the time of a child’s party is Sunday after 12 noon. The cost is £45 per hour. We charge from the time you arrive until the time you leave. (plus a £100 refundable deposit). The ideal time for a child’s party is between 12-5pm. If 5 hours sounds like a long time- it really isn’t! The thinking behind the timing is to minimise the stress on the parents and to ensure the day is enjoyable for all. 12pm the hall will be opened up for you to set up and decorate the hall to your taste. Suggested party duration is between 1-4. Bare in mind an hour for party food and cake. 4pm your guests would leave, and this gives you an hour to clear and tidy away before 5pm. About three weeks before the party, you’ll need to send out invitations. The age your child will be. The venue address, including postcode and your phone number. The address of Blackwell Hall is 90, Uxbridge Road, Harrow Weald, Middlesex HA3 6DQ. A theme for your party. Whether your child is Minion mad or potty about Princesses, a theme is always fun. Kid’s tables and chairs. At Blackwell Hall, we have a number of small tables and chairs suitable for children to use for their birthday food. bouncy castles- always a great way to entertain children! entertainers-relieve the pressure on parents. 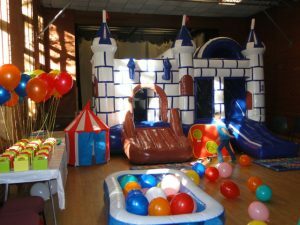 The hall is also large enough to accommodate bouncy castles (we do not have bouncy castles- you would need to organise this via a bouncy castle hirer) We do charge a one off £10 if you hire in a bouncy castle as they consume a lot of electricity. The main hall measures 7.6m (25ft) x 13.4m (44ft).